Today I set up my own wireless network in my house! I am decently technologically capable, but had never done this before. So I sauntered into my local Best Buy this morning for some geek talk. And I found just the right youngster to help me out. He tried to sell me a brand I hadn't heard of, and though it was probably the Google of wireless routers, in the end I chose the Cisco brand instead because I am a sucker for "heard of it before" and it was $20 cheaper anyway. You can see the link below--if you don't need immediate gratification, Amazon sells it for a couple dollars cheaper. So yes, I am celebrating my technological triumph! For a few weeks now at work we've been laughing about the Nick Burns character from Saturday Night Live. My office-mate at work is that guy, minus the assholeness. But he does chuckle at the inside nerd jokes! Here is a funny episode to check out. So basically what I'm saying is that with my new skills, I'll be acting like this pretty soon. By the way, You're Welcome! 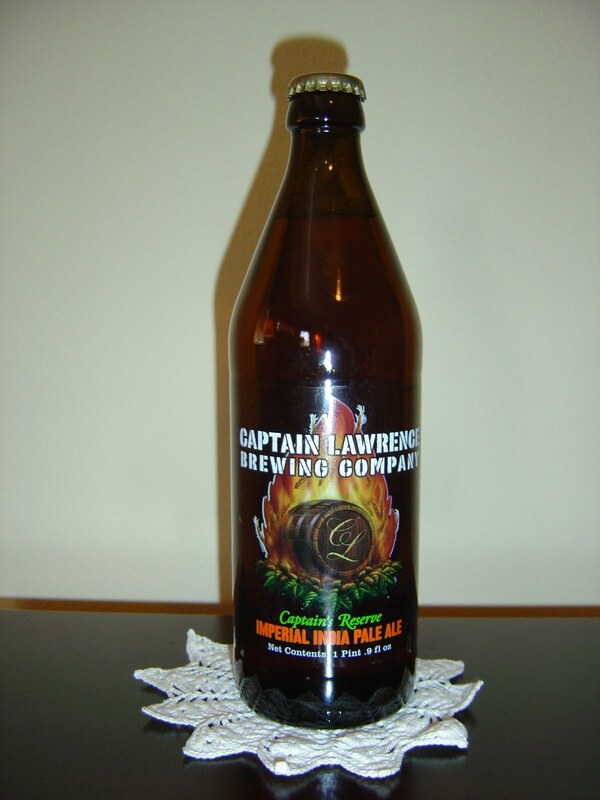 This afternoon I'm drinking Captain's Reserve Imperial India Pale Ale brewed by Captain Lawrence Brewing Company in Pleasantville, New York. First off, where were all the cool local breweries when I lived in Westchester for eight years? These guys opened their doors in 2006. Owner and Head Brewer Scott Vaccaro says on the label that "this beer is the ultimate hop lovers dream come true". 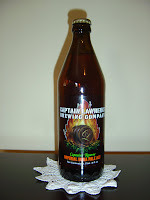 The label includes an illustration of a barrel in front of a roaring fire. Fruity with lots of orange and peach and pineapple, sweet, bright aroma! Very big hoppy start with plenty of pine and citrus right away. But immediately that initial bite was washed away with some complementary caramel and malty bread flavors. Some orange intermingled with lots of black peppery spice is also a very noticeable flavor combination. Oily, sticky, good body. Seems that all the components are BIG but balance out wonderfully, with bitter winning by a hair in a refreshing fashion. The alcohol is a little unmasked by the end and provides a dry finish. This was a really terrific beer. Besides the flavors, I liked the 16.9 ounce bottle size because everyone knows 12 isn't enough! For those of you who have had Hopslam, the aroma is awesomely tropical fruity like that. But the flavors lean much more to the bitter side with some kick. I'll be looking forward to my other Captain Lawrence beer that came back from New York! If this is available to you, you should be drinking it now!